BuildandPest.com provides Brisbane and Ipswich home buyers reliable, independent, professional building and pest inspection reports at a surprisingly competitive rate, including Free Thermal Imaging. Why choose us for your building and pest inspection? You get an independent, professional inspection of the property, because we work only for YOU. You get a highly experienced team that has already done over 10,000 building and timber pest inspections. 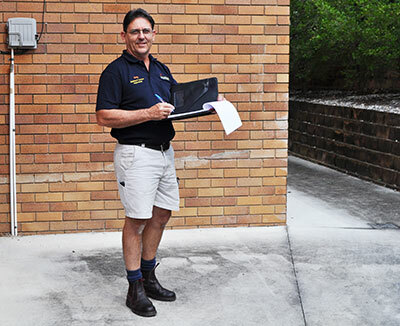 Your building inspector is a licensed Master Builder and a member of the Queensland Master Builders Association. Your Timber Pest Inspector is fully accredited, a member of the Australian Environmental Pest Managers Association and very experienced at locating termites, termite damage and conditions that indicate, or can lead to, termite activity. Your inspector is fully insured, so you are making a safe choice. You can contact us 7 days a week for inspections across the Greater Brisbane and Ipswich areas. You get the best service, because we believe that a sound business comes from good service. You save money, because we cover both your building inspection and your pest inspection. Please call us on 1300 78 75 73 or fill out our quote form to enquire about our building and pest inspections and we’ll get back to you as soon as possible with some of the best prices in the industry! We would like to thank you very much for the building and pest reports. They were very detailed and thorough, and we would like to thank yourself and Greg for your professional service. We are very satisfied, and are happy to highly recommend your business to others. Thanks BuildandPest.com.au, as always for your great building and pest inspection service and for Greg’s expertise (and patience explaining things to me!). Will definitely continue to recommend you to friends and family. Just wanted to say a big thank you to BuildAndPest.com.au. Being that this was our first house purchase we were a little bit ‘green’ with it all – but was made a whole lot easier with your help. Greg was great onsite, he was very thorough and took the time to show me through the issues he had found. I would be happy to use your company in the future or recommend you to anyone. Thanks so much for your assistance. The set up was smooth and you were a pleasure to deal with. I was very impressed with the building and pest inspection; Greg was extremely thorough. We will definitely recommend your business. Thanks so much for your thorough approach, professionalism and the time you spent providing insight and a clear understanding of the outcomes of your building and pest inspection. Thanks for also going out of your way to make it happen. We really appreciated it and will happily recommend you to friends.